The important ministries in Venice and Milan are probably responsible for the fact that Scola’s name is currently on every list of the most promising candidates for the papal office. Several Popes of the 20th century were responsible for one of these two dioceses before beeing elected Pope: Pius X. (1903-14), John XXIII. (1958-63) and John Paul I. (1978) had been Patriarch of Venice, Pius XI. (1922-39) and Paul VI. (1963-78) were elected Pope as acting Archbishops of Milan. Archbishop Angelo Scola is considered to be open-minded and open to dialog, for his critics, he lacks charisma. He is also a confidant of Pope Benedict XVI., which is considered a disadvantage by those cardinals, that pressed for a profound change in the Curia after the scandals in the course of recent years. Scola is said to have been decisively involved in the establishment of the “Pontifical Council for promoting the new evangelization” in the year 2010, which some experts see as one of the greatest achievements of Benedict XVI’s papacy. Scola is a member of this new institution since its foundation. Scola earned special merit in dialogue with Islam. The “Oasis Foundation”, an international organization promoting the dialogue between Christianity and Islam, developed from his initiative. 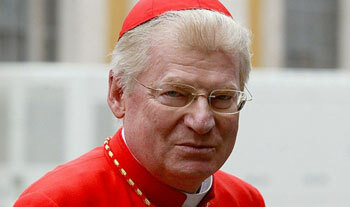 Cardinal Scola commented repeatedly also publicly on the interfaith dialogue, such as the discussions in Europe about the Islamic headscarf or the “Arab Spring”. Theologically, Scola is considered a brilliant thinker, his publications mainly deal with the topics of marriage and family, as well as bioethical issues. This entry was posted in Pope Candidates and tagged Angelo Scola, Archbishop, Archbishop of Milan, Benedict, Christianity, confidant, Curia, diocese, europe, Institute for Marriage and Family Studies, Islam, Milan, ministries, Oasis Foundation, Papal office, patriarch, Pontifical Council, Pontifical Lateran University, succession, Theological Anthropology, Venice by Osservatore. Bookmark the permalink.